Precious metals futures changed little Tuesday. Gold climbed less than 0.1%, but in doing so rebounded from a three-week low. Gold for June delivery gained $1.20 to settle at $1,295.40 an ounce on the Comex division of the New York Mercantile Exchange. "Equities have turned negative here … It’s a tug of war between the equities and precious metals markets," said Bob Haberkorn, senior market strategist at RJO Futures. "Gold is going to be stuck in a range-bound movement for the time being unless there is a breakdown in equity markets." 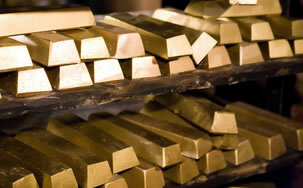 Gold futures traded from a low of $1,289.50 to a high of $1,296.40. They fell 0.3% on Monday, ending at their lowest point since March 11. Silver for May delivery declined 3.8 cents, or 0.3%, to settle at $15.061 an ounce. Silver futures ranged from $14.90 to $15.09. Yesterday, they dipped less than 0.1%. Last Thursday, prices settled at $14.973 an ounce for their worst close since Dec. 24. July platinum lost $2.80, or 0.3%, to $852.50 an ounce, trading between $849.40 and $859.40. Palladium for June delivery advanced $8.50, or 0.6%, to $1,400.30 an ounce, ranging from $1,364.80 to $1,408.50. Gold fell $3.20, 0.3%, to $1,290.30 an ounce. Silver declined 4.5 cents, or 0.3%, to $15.025 an ounce. United States Mint bullion sales climbed up by a combined 1,000 ounces in gold coins, by 500 ounces in platinum coins, and by 276,500 ounces in silver coins.